2. 'Down below in B Corridor, Brett and Dallas looked up--' (Acid drips from the ceiling) "What's going on?" asks one of them, and then answers his own question, "It's acid, eatin' through the deck!" 3. "Keep back!" One of them shouts as Ripley appears on the scene, and acid splashes onto the deck. 'DRIP!' 'SIZZLE' "Look Ripley. What do we do?" someone—maybe Lambert— asks her. 4. A happy, relieved Ripley says, "Hey look. It's stopped! Good thing too! We would have been 'hulled'!" 5. 'Brash'—in closeup—says, "Well! We can't do any more for Kane!" To which, someone responds, "Why?" Review: "Few adaptations are as raw, personal, and primal as this work by John I. White: an eleven-year-old's graphic novel based on Ridley Scott's "Alien." The site traffic is dropping again - after the craziness of last week and yesterday. Oh well, I knew it wouldn't last. Looks like it's just you and me again reader. I'll be clinging - Sunset Boulevard style - to my reviews, all alone in my solid gold house, wondering when George Lucas will call? See panel 2? I actually still remember that line: "Down in B corridor Brett and Carson looked up -"
It was later changed with black marker to Dallas. I really seemed to have been confused about who was who. 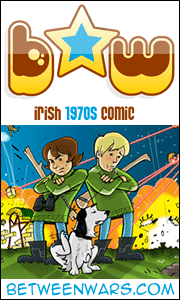 I only had the novel and its photos to go by at the time that these ones were drawn in 1979. I wondered if there was a Brett Carson character in something I'd seen or read, like Bearcats or Marvel. 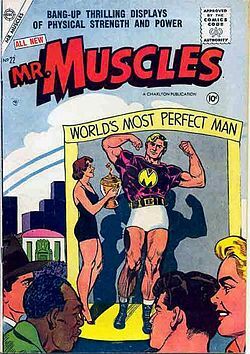 There was one but I doubt that I ever saw it: Brett Carson aka Mr.Muscles! I've often thought of doing a strip with a big-chinned hero character called Crash Dexter or Smash Bannister. International stuntman assassin detective - or something. Brett - Ash - the hat? "Look Ripley what do we do! (odd statement - not a question) We're a bunch of useless idiots!" 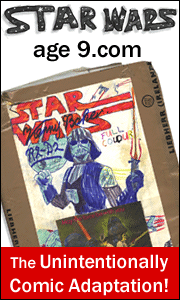 Maybe they'll get the restorers in the National Gallery of London who ruined all of those masterpieces such as Holbein's Ambassadors to recover the old cover of this comic. It's stuck onto the later cardboard cover. I wonder what it looks like? At the risk of stretching your attention past the limit, it's just occurred to me: I haven't been pushing the other comic that paved the way for this one. 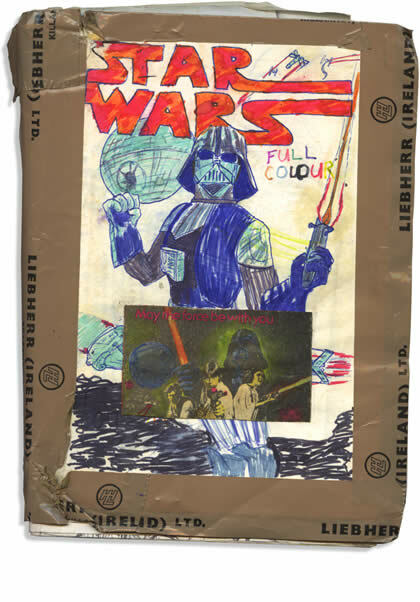 For those of you who don't know, this peculiar business of publishing my childhood home-made comics began over 2 years ago with the - actually far superior and funnier - Star Wars age 9. 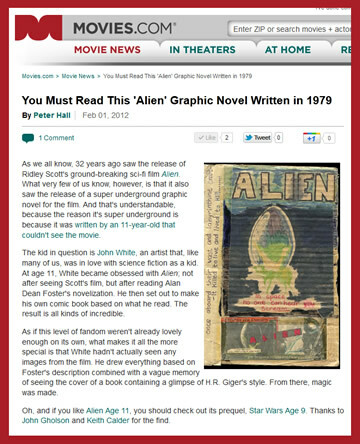 ALIEN age 11's been getting huge attention lately. 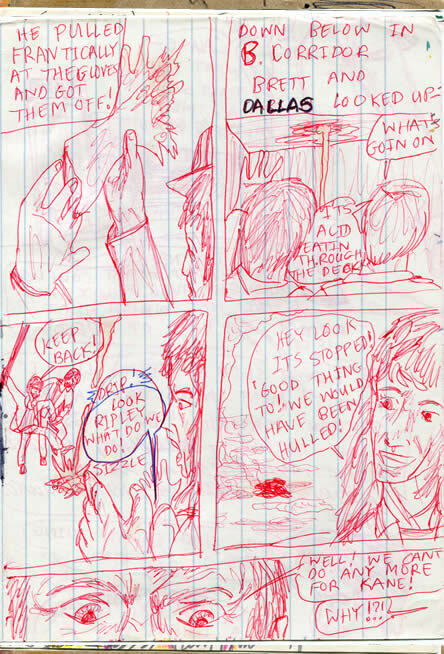 I think mainly because of the 'he drew it without actually having seen it' angle (which is true for most the pages). But SWa9 was started when I was even younger, so it's far sillier looking. It's also an epic 196 pages! Why not check it out and follow it on Facebook and Twiiter! More from the '70s on Friday!